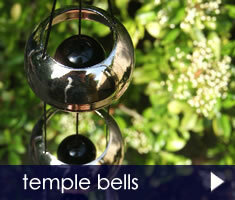 Nature's Melody offer high quality, yet affordable wind chimes. Using only the best components and tuned by master craftsmen, these musically sounding chimes make the perfect gift. The larger of the classic chimes (18" upwards) feature a "mute" button - a small plastic toggle immediately below the striker which allows this to be moved down so it does not make contact with the chimes, thereby reducing noise levels if it is very windy.